I have always been a foodie, but it took a bit of time after I went paleo to really start to play with recipes and make my own creations. 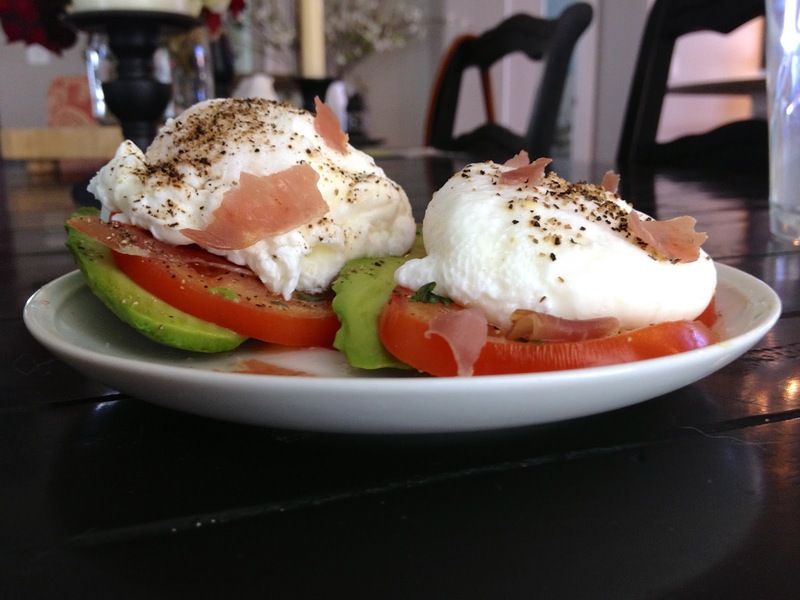 The hardest transition was breakfast because I had always eaten carb heavy meals first thing in the morning and with paleo it seemed like egg "muffins", scrambled eggs and fried eggs were going to be my life. I needed to figure out new, improved ways to make breakfast! Here are some of my favorite recipes. I hope you like them! All recipes are for a single serving. This may sound like a healthy breakfast, but it doesn't taste like it! This meal is hearty and so rich! The savory taste of the roasted mushroom, the robust flavor of the tomato, and the creaminess of the ricotta all play perfectly with the egg. This is like heaven in your mouth. Slice the large tomato, and place it into a baking dish with the halved cherry tomatoes. Salt and pepper as desired, then add the oregano and garlic over top the tomatoes. Mist lightly with olive oil. Place in oven. The tomatoes will cook for approximately 18-25 minutes until lightly brown and soft. While the tomatoes are cooking, clean the mushroom, scrapping out the gill and steam. Mist with olive oil and sprinkle salt and pepper inside the mushroom. Place it open side down on a baking dish, and mist the top with olive oil and salt and pepper as desired. Place in oven for about 5 minutes, then turn over mushroom and replace back in over for 5 minutes. Remove the mushroom from the oven and add the ricotta into the cap. Replace in oven until ricotta begins to brown, 5 -10 minutes, checking often. You can prepare your egg however you like-- fried or poached is recommended. I've also had this recipe without an egg and it is delicious on it's own. While the egg is cooking, sauté the spinach over medium high heat with some olive oil, salt and pepper until wilted. To plate, place the tomatoes on dish with the spinach. 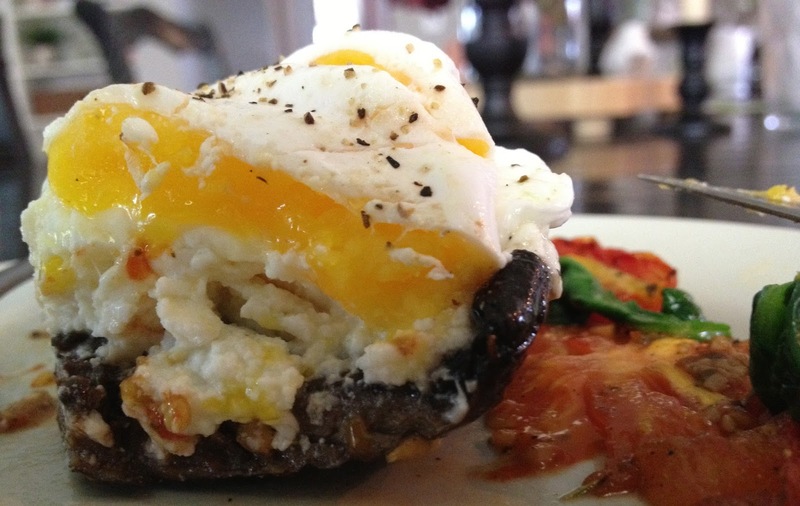 Add the mushroom and top with the egg. Enjoy! Seriously Yum! I made this one day when I was home alone and I couldn't wait to make it for the man! He LOVE it. It's got this great balance of smokey, creamy, and spicy. I will make this again and again! One of my favorites! Saute the spinach in a pan over medium high heat. While it's cooking, crack two eggs in a bowl and add about 1 TBSP of water. Beat those eggs into submission with that whisk! Once the spinach is done cooking, remove it from the heat. Give the eggs one more good whisk and then add the eggs into the pan. Sprinkle the rest of the ingredients onto the omelet (except avocado and salsa). Salt and pepper as desired. Wait until the sides start to look done and a bit bubbly. Now you can flip one half of the egg mixture onto the other half, using a spatula to create the omlete! Cover the pan and remove from the heat. Let it sit for about 10 minutes and then it will be ready to eat! I love to serve it with avocado and salsa on top! Yum! When you wake up and you are craving starch, make this! It's got such a great blend of crunchy, smokey, and smooth. The textures and tastes just play together so perfectly. On medium heat cook the bacon and once it's browned, set it aside on some paper towels to remove some of the oil. Add the chopped onion into the bacon grease. As they cook, add the spices to the sweet potatoes and stir to combine. One the onions have softened, add them to the pan. Let them cook for a few moments until fork tender and then take a spatula and squish the yam and onion mix into the bottom of your pan. You will be tempted to move the mixture. Do not! Let them sit that way for a couple of minutes so the bottom crisps up. After 2-3 minutes, stir the mixture around and then press it back into the pan to crisp up more. Repeat this until you get your desired level of crispness. You can cook your eggs any way you want them really: fried or sunny side up would be my preferred method because I like the runny yolks. Once you finish the eggs, add them to the sweet potato hash. I like to chop the eggs up and mix them into the hash and then add the avocado on top. This one is so easy! I was inspired because my normal, quick breakfast before paleo was fried eggs over toast and I think I'm so conditioned that it just feels wrong to not put the eggs on something! 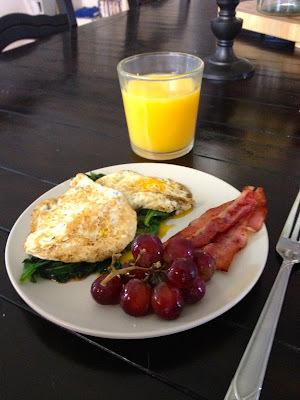 The spinach is great as a base and it really blends wonderfully with a runny yolk. Yum! Pan fry bacon over med-high heat. Use a paper towel to blot off any excess oil. In the same pan used to cook the bacon, sauté the fresh baby spinach with some garlic until it wilts. Turn the heat down to medium and in the same pan crack the eggs. Salt and pepper as desired. Let them cook for about a minute on each side. Place the eggs on top of the spinach. Serve with bacon and fruit. Delicious! 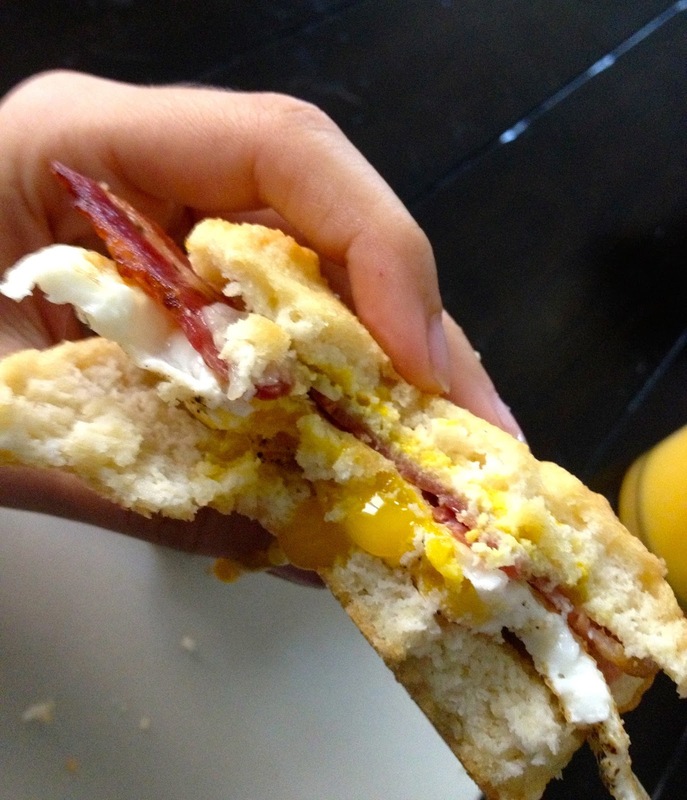 Oh, I love a good breakfast sandwich! Since becoming paleo, I have really missed it! Lately, I have found myself dreaming of biting into the soft bread, feeling the crunch of the bacon and the ooze of the egg all in one glorious bite. Thanks to my friends at Healthbent, I have found a way that I can still enjoy that same feeling, but using paleo methods instead. I call that a win. Mix almond flour and cold butter with fork until well combined. Add egg whites baking powder and salt. If the batter appear runny, add more almond flour. Dollop the batter onto a baking sheet, making two equal size biscuits. Cook for 20-23 minutes. The tops should be firm and golden, but when you press on middle, it will give. Cook bacon or sausage patty. When done, blot with paper towel to remove grease. Fry eggs until yolks are starting to firm, but still soft. Place egg, cheese (if using) and bacon onto sliced biscuit. Spread condiment of choice on top slice of bread. I enjoy mustard, but the man prefers mayo. Are you ready for a fancy meal? For some reason a poached egg always begs some respect. I love to serve poached eggs for small family brunches because it just looks so elegant. While the eggs are poaching, place prosciutto in pan over medium high heat. Cook until crispy. Slice the avocado in rounds and place on a plate. Slice tomatoes and place over avocado and lightly seasons with salt and pepper. Sprinkle a few pieces of prosciutto (or bacon) over tomato. When eggs are finished cooking, blot with a paper towel to remove excess water. Place on top of avocado and tomato stacks. Salt and pepper egg and sprinkle with remaining prosciutto. Once a week I splurge and make something sweet and a little more carb heavy! These are still paleo approved because they use healthy flours and no processed sugars as a base. They are delicious and they definitely satisfy those carb cravings! After all, you have to have a day where you at least feel like it's a "cheat" day! 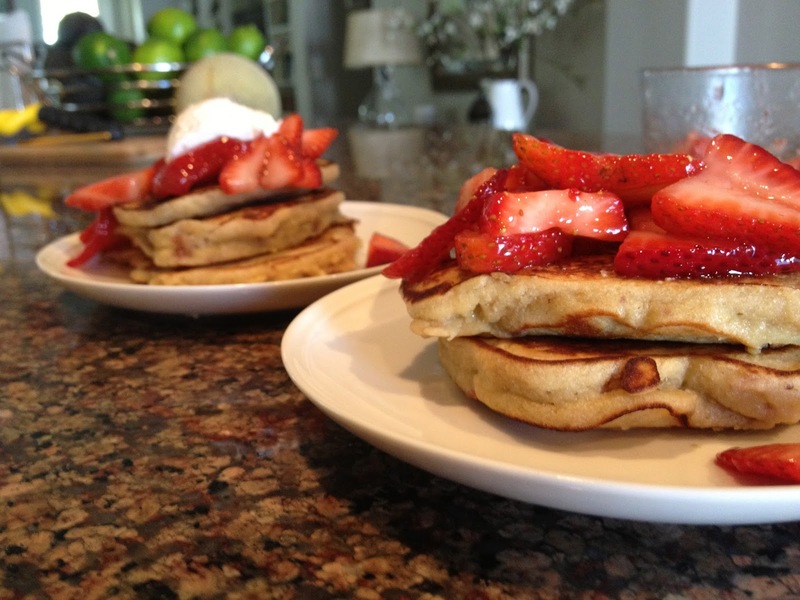 See my posts about paleo approved pancakes and muffins. I hope you like these recipes!